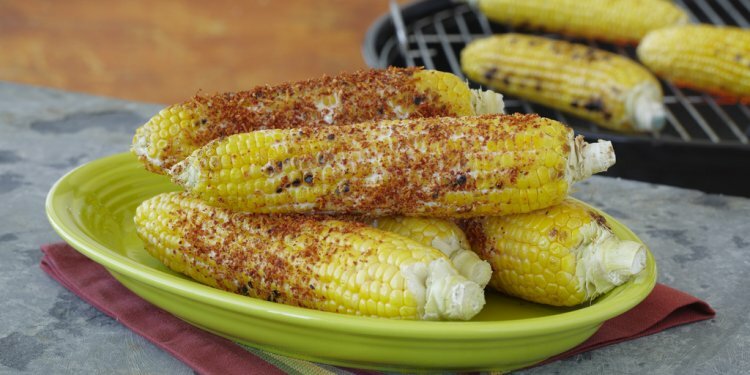 This has to be the best side dish to prepare when you are grilling steaks. It’s the perfect steak side dish. First off, potatoes are a great addition to a steak dinner. Second, twice baked potatoes are incredible. Third, the timing is perfect on this side dish when you are grilling – the potato can just sit in a warm oven while you tend to your steaks on the grill. Melt a little bit of butter in a small bowl. About a tablespoon, maybe a bit more if you like (you will use the remaining melted butter later when you mash up the inside of the twice baked potato). Then use a brush and paint the skin of your potato with the butter. Liberally sprinkle the kosher salt on the skin of the potato and bake at 425 degrees for about 1 hour. Mmmmmm, notice how the butter really helps the salt stick to the potato! After about an hour or so your potato should be fully cooked. Take a teaspoon and scoop all the insides of the potato into a small bowl. This leaves a hollow potato that is ready for the filling. Into a small bowl, dice up a few cloves of garlic, pour in a little bit of milk, sprinkle some salt and pepper, add some cheddar cheese and start mashing! If you are feeling crazy you could even add some bacon! Be sure not to over mash the mixture or the potato will get really gummy. The amazing part of this recipe is that pretty much any amount of the above ingredients works great. You can reduce the cheese and add bacon, or increase the cheese and add more garlic! I would warn that you should only add perhaps a tablespoon or two of milk to the mix otherwise it will be too runny. After the mixture is to your liking, scoop it back into the potato and top it off with some extra cheddar cheese. At this time you can either refrigerate your potatoes or proceed to a 325 degree oven. This is when I start to get my charcoal ready for my steaks. The potatoes can sit in a 325 degree oven for quite a long while without burning. Keep an eye on your steaks (or whatever else you are grilling) and when you have maybe 5-10 minutes left kick up the oven to perhaps 450 or so degrees to really make sure the cheese is melted on top. Let them cool and enjoy!